This B&H Kit combines an AOPEN nTAKE PRO with Three 46" LED Monitors for showcasing your digital signage content on a ceiling. 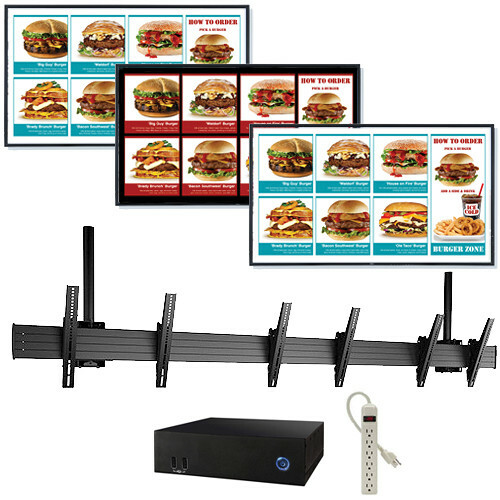 This kit is designed to provide a complete out-of-the-box solution for mounting the monitors in landscape mode, and displaying your on-screen content in environments such as restaurants, schools, retail stores, hospitality, board rooms, and more. The AOPEN nTAKE PRO P201 digital signage menu board solution includes a media player and content management software; the included software offers menu templates, scheduling, and publishing functions. This software allows you to conveniently create digital signage in your business environment. The nTAKE PRO 201 also features built-in Ethernet connectivity, remote content management, 1080p resolution output, and multi-monitor support. The three bundled NEC V463 46" LED monitors allows you to display your digital signage content in detailed Full HD 1920 x 1080 resolution with a 4000:1 contrast ratio and up to 500 cd/m2 maximum brightness output. These monitors can be connected to the nTAKE PRO 201 via HDMI connectivity. A 3 x 1 adjustable mount is also included in this kit for secure and convenient ceiling placement of the monitors in landscape viewing orientation. Rounding out this bundle is a 6-outlet power strip for simplified AC power connections.